Christmas will always inevitably lead us to think of presents for our friends and family, reminding us that Jesus was given freely and willingly to us, and as a representation of the gifts given to him by the wise men at his birth. Just as in chapter 2 of Matthew’s Gospel, where wise men from the East offered up gold, frankincense and myrrh, so too, later, in Matthew 25, gifts given to Jesus are mentioned. In this parable, Jesus explains to the nations before him at the Last Judgement that our acts of love and service to those in need are actually counted as gifts to him. It’s a beautiful and heartbreaking reminder that those in need in the world are our family in Christ, and, although described as ‘the least of’, they are no lesser in value to our Heavenly Father. Rather, they are immensely important to him, and his plea is for us to help those suffering. This year, particularly recently, our hearts have been impacted by the number and scale of emergencies and natural disasters around the world. At Anglican Overseas Aid, we have responded to a number of crises through our church partners, notably in Vanuatu, aiding those affected by the volcanic eruption, and in Indonesia, helping those devastated by the tsunami. We respond to emergencies like this out of our Rapid Response Emergency Fund. This fund exists to enable us to respond at the earliest opportunity, so that we don’t have to wait until we start receiving funds for the latest crisis in order to act. For this year’s Christmas Appeal, we are reaching out to you to help us keep responding quickly and effectively to disasters like those in Vanuatu and Indonesia. Our reserves are running low and need to be replenished so that we are always in a position to provide immediate help. Aliyah, as pictured above, is just one of those who we have been able to give assistance to in times of crisis. 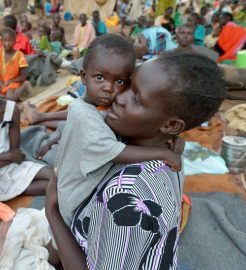 She is one of many thousands who were displaced by widespread armed conflict that engulfed Wau, South Sudan. She was able to seek refuge at a camp that we were supporting run by the Episcopal Church. The question is – when we see images like the one of Aliyah and her child, do we see Jesus? Do we respond knowing that we are actually responding to Jesus himself? Our Rapid Response Emergency Fund has been used over the years to respond to disasters in various parts of the world. From famine in South Sudan, to the Rohingya refugee crisis, to this year’s tsunami in Sulawesi, Indonesia, money from this fund has been deployed to respond with immediate care for people who are in dire need. The immediate and life-saving needs include food, shelter, clean water, safe spaces for children, and medical care. Without your support we would not have been able to respond as quickly as we have. Your support for the Rapid Response Emergency Fund has and will continue to save lives. We never know when disaster will strike a particular location. When it does happen though, responding with the compassion of Christ is something that we are called and privileged to do. Each crisis and disaster is different and requires a specific plan of action and assistance. 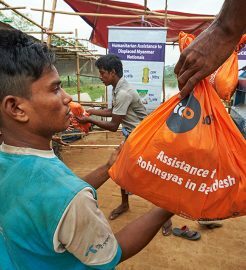 However, together with our ACT Alliance and CAN DO partners, we are uniquely positioned to have the partners on the ground who are able to render the assistance that people need, when they need it. To donate to our 2018 Christmas Appeal, click on the ‘Please Donate’ button below (choose ’01. 2018 Christmas Appeal’ from the ‘Donation’ drop-down menu) or call us on 1800 249 880.